Restore Your Smile, Keep Your Schedule. CEREC technology allows us to create strong, customized, tooth-colored ceramic restorations right here in the office, usually within a single appointment. No temporary or second visit is required and the aesthetics are beautiful. Cosmetic dentistry refers to a variety of dental treatments and procedures that are customized to improve the appearance of teeth and gums. Our cosmetic dentistry services are more than simply cosmetic. We believe that everything we do should have a positive impact on the health of your smile, as well. Invisalign® is a series of clear, removable teeth aligners that our Palo Alto Orthodontists use as an alternative to traditional metal dental braces. Invisalign® takes a modern approach to straightening teeth, using a custom-made series of aligners created for you and only you. A complete cleaning and prevention program is a cooperative effort by the patient, dentist, and dental staff. It allows you to preserve your teeth, gums and the bone around your teeth by preventing the onset, progress, and recurrence of oral diseases. 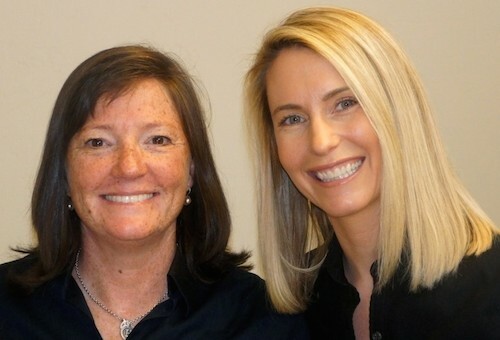 Palo Alto Dentists Dr. Christine Hansen and Dr. Roberta Jurash offer complete general and cosmetic dentistry. Drs. Christine Hansen and Roberta Jurash have their patients’ best interests at heart and stand behind their work. 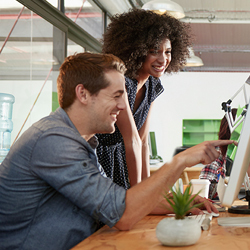 Together they are dedicated to providing the most up-to-date best practices and have a dedicated staff of service-oriented professionals. THANK YOU, YOU DID IT AGAIN!!! 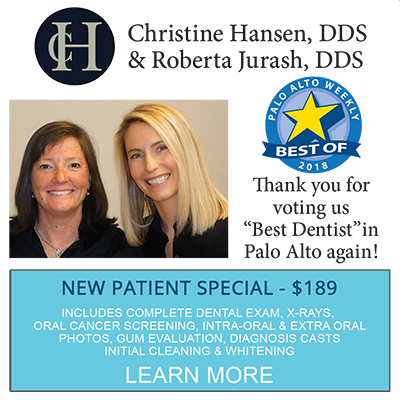 We are very proud and appreciative that we are able to announce that through your support we have been voted the Best Dentist in Palo Alto 2018. Thank you, your vote of confidence means the world to us. We know that you have many choices for your dental care. We also know how important your health and smile are. That’s why Palo Alto Dentists Dr. Hansen and her associate Dr. Jurash are proud to offer comfortable care in a relaxing and tranquil environment. Whether you would like a blanket or just listen to your favorite music, our focus is solely on the health and beauty of your smile. Our consultation room is a private area where you will be able to speak with Dr. Hansen, Dr. Jurash or one of our team members about your customized treatment plan. Along with viewing examples of completed treatment, we will take time to explain procedures and fees so you feel fully informed before proceeding with your treatment. Are you looking for the smile you used to have or the smile that you always wanted? Let us know. After talking with you and finding out what is important to you, we will analyze your smile and make recommendations. Providing our patients with the beautiful, natural, healthy smiles while taking care of their oral health is our greatest pleasure. Modern dentistry allows us to use the latest technology to create natural tooth colored restorations. At our state of the art office, we routinely provide a wide range of cosmetic dental procedures. Your Palo Alto Dentists Drs. Hansen and Jurash, practice a full scope of Family and Cosmetic Dentistry with expertise ranging from Porcelain Veneers to Dental Implants, Dental Crowns and Bridges. Drs. Hansen and Jurash can now correct a wide variety of permanent cosmetic dental problems, and can literally redesign your smile. Drs. Hansen and Jurash also provides Emergency Dental Care, CEREC Same Day Crowns, Same Day Dental Appointments and Invisalign Clear Braces. If you don’t see the procedure you are looking for above, please take a look at our cosmetic dentistry page or contact us to see if we perform the service you are looking for. 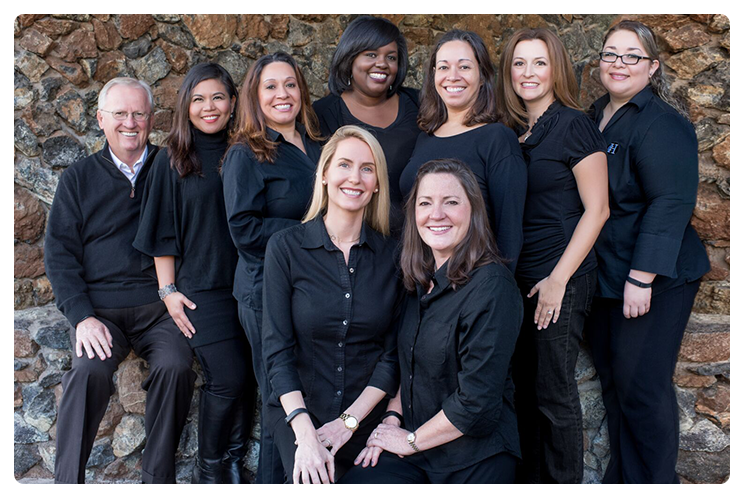 If you are searching for a dental office that offers high-quality, professional dental care in a compassionate environment, we invite you to schedule a complimentary consultation at The Dental Office of your Palo Alto Dentist Dr. Hansen today. This section is devoted to providing information to our patients. We believe the better informed you are the more comfortable you will be in making the right decisions to have a smile for a lifetime. Come on in. The first step towards a beautiful, healthy smile is to schedule an appointment. Please contact our office by phone 650.326.3290 or complete the New Patient Forms. Christine E. Hansen has the finest equipment and state of the art updates whenever it is possible. I know a lot about dental practices, and this one is the very best. I have been going here for 7 years. Another way I know this is a good practice, the staff stays, most everyone has been there for the seven years I have been going here. That says a lot about the integrity of the doctors. I like that! Everybody was kind, helpful and professional. They always explained what they’re going to do, and reassured me that if at any point I feel uncomfortable they will stop. If there were 6 stars, I’d rate them 6. I am the biggest crybaby on the planet when it come to the dentist (needles) and they tolerated my whimpering. I am extremely difficult and high maintenance and everyone in the office made me feel at ease. Professionally run, super clean and inviting. I am so thankful a co-worker recommended Dr. Hansen. I still am waiting for dentistry without needles, but for now, I hope they will accept me back! In the course of one visit, we can prepare your damaged tooth, create an optical impression of the tooth, and use CEREC to design and mill precision restoration, which is then permanently bonded to your tooth. No mess, no discomfort, no wait. Get the smile you want and get back to your life. We know you’ve got more important things to do. Each of us has concerns about our dental health. Some patients get nervous even thinking about the dentist. Dental phobia is much more common than you might expect. It is for these patients that we offer a solution that eliminates this anxiety. Imagine showing up at our offices, taking a pill and waking up with all of your dental work complete. It is a wonderful service and one that we are proud to provide. Are you missing any teeth? Do you want the longest lasting tooth replacement option available? Dental implants enable us to replacing missing teeth and give you a long-lasting functional beautiful smile. Every day we use our teeth to eat, smile, laugh, and talk. 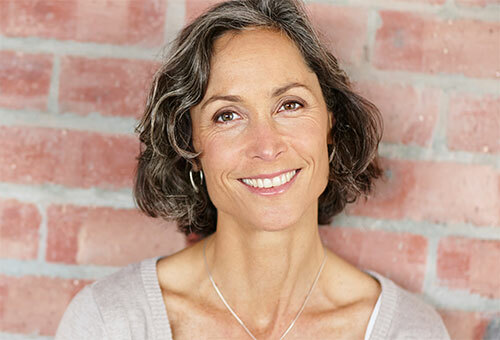 You can have the confidence to smile, talk and chew your food without spaces or missing teeth, and an implant is much easier to keep clean than other options. What is Invisalign? Invisalign is also known as clear braces. It is a set of progressive removable clear aligners created specifically for your teeth to align them properly. It is an excellent way to straighten your teeth to improve your overall oral health, without the use of traditional wires and brackets. Having properly aligned teeth can prevent tooth fractures, help your crowns and fillings last longer, prevent more treatments later on.